I’m freezing. I blame the environment. Recently I’ve turned the thermostat down because the days are getting warmer. Just not every day. I try not to mess with the thermostat too much because my mom told me that if you turn it up and down it wastes energy. So now I don’t. Ever. Except when I do. But recently I’ve been thinking about this a little bit more because of a woman my husband and I met on a plane. Her husband teaches what I would term environmental philosophy because I can’t remember the actual name. They are doing their best to simplify and minimize their effect on the environment. They buy clothes at consignment stores because it’s using less resources. They buy local food or they only buy food that’s in season to lessen transportation of the product. They try to only use natural sources. And they keep their thermostat low. So low that they wear sweaters and at times hats to stay warm. Right now I am wearing a hat but that is due to the fact that my hair looks so bad I don’t want to chance the possibility I may see myself in the mirror. And I’m writing this is front of two windows. I’m trying to be a good neighbor. It’s a Red Sox baseball hat. Not a knitted cap. Since meeting her I have been thinking about recycling, reusable fuel, and waste. I turn down the heat the day I get the bill… until it’s 15 degrees again. I try to knit my own hats and scarves out of natural wool but I have to admit that’s because it’s softer. I do things nice for the environment, but not really for the right reasons. I’ve decided it’s ok my motivations aren’t pure. It’s the end results that are important. 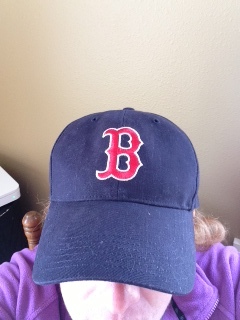 Now if you’ll excuse me, I’m going to go knit myself a Red Sox hat. This is going to look great in Alpaca. PreviousEveryone Should Have a TikiNextStalking the O.C.